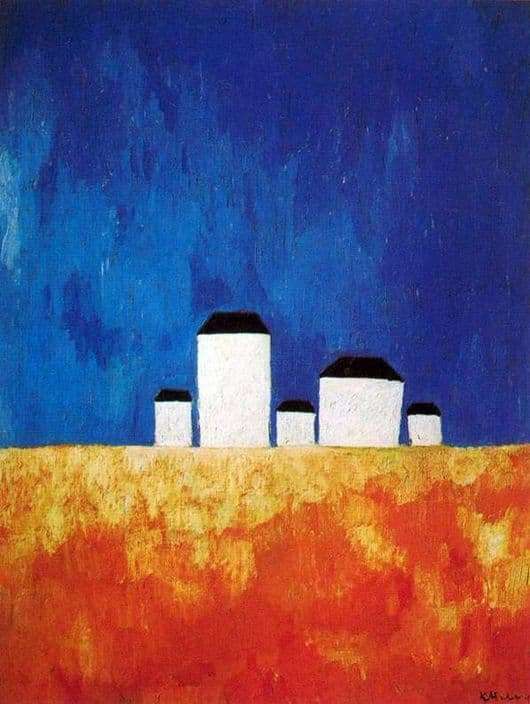 One of the paintings of Kazimir Malevich, written by him in 1932, is called “Landscape with five houses” and painted in abstract genre with oil. The analysis of such works is always controversial and, as a result, causes a lot of disagreement, but we still try to give elements of this picture some justification. “Landscape with five houses”, perhaps, is a work by which the author seeks to draw the viewer’s attention to the harmony of human coexistence with nature, which in no case can be lost. It can be assumed that the five buildings without doors and windows, standing along the direct horizon, should not cause gloomy associations, but only abstractly show the result of human activity. They stand just at the junction between dark blue, rolling in blue, sky and brick-red, acquiring yellow, and then – pinkish-white earth (most likely, this is a field of wheat or rye). The cloudless sky is the infinity and immensity of the universe, and the earth contrasting with the sky is reality and being. In general, for the artist from 1932 begins a special period in life. After he received the post of head of the Experimental Laboratory in the Russian Museum, some of his works were included in museum expositions. Then, he wrote the fourth, the last of the Black Square versions, which he had prepared for the exhibition Artists of the RSFSR for XV years. This version of the square today is stored in the Hermitage. And his next work, begun in the same, but still unfinished, was the painting “Social City”. In these last years of the artist’s work, abstract images have already been replaced by realistic portraits. And in 1933 he began cancer, from which in 1935 he died. Like many other paintings by Malevich, “Landscape with five houses” is a very simple at first glance work and very controversial. But the hidden idea, its excellent embodiment in harmoniously combined colors and shapes makes it a very valuable exhibit of world culture.